Is it a high one or a low two ???? 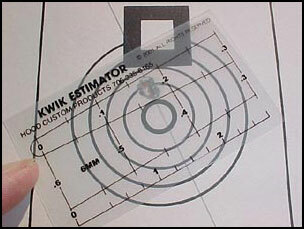 Carry the Kwik Estimator in your shirt pocket to easily estimate group measurements ! Bracket the group within the diverging lines of the Kwik Estimator and get a good approximation of the actual group size. No more trips to the tool box for calipers.